JNN 23 April 2014 Doha : Amnesty International, the UK-based human-rights group, has accused Qatar for failing to protect migrant domestic workers, saying they are exposed to a greater extent of abuse than construction workers and are trapped by employers. It said some of the women interviewed reported being “slapped, pulled by the hair, poked in the eyes, and kicked down the stairs by their employers” and that three said they were raped. A separate report focusing on domestic workers in the 2022 World Cup host country was published to ensure they were not a “footnote to the issues construction workers face”, Amnesty researcher James Lynch said, according to the news agency Associated Press. About 84,000 women domestic workers are employed in Qatar, most of them from South and Southeast Asia, Amnesty said. Some told the campaign group’s researchers they worked “up to 100 hours a week with no day off”. “Under Qatari law there are no limits on working hours for domestic workers and there is no requirement to give them a day off. They are also unable to lodge a complaint with the Labour Ministry,” the report said. The chairman of the country’s National Human Rights Committee declined to comment and referred questions to government ministries. 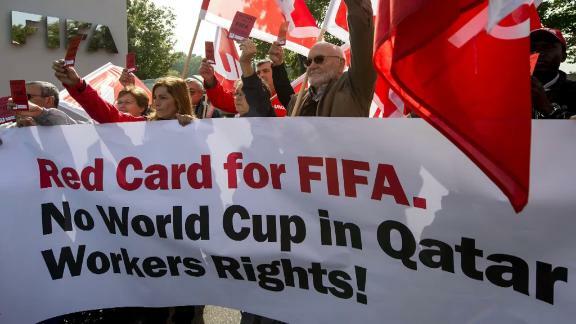 This entry was posted in Middle East and tagged Amnesty International, construction workers, Domestic Workers, FIFA World Cup 2022, migrant domestic workers, Qatar, Workers Rights Protection. Bookmark the permalink.